Run: Inspire Crops I was pleasantly surprised by these pants. I will be adding these in the fall for sure as needed but I’m going to wait for it in the Blue or perhaps Lolo if it comes in that color combined with black and not grey. I’m 5’4 and these were hardly crops on me. It was rather funny but these went down right to about where my feather weight socks would be, just slightly higher. I guess 5’4 isn’t too short but I do have pretty short legs. That’s ok though because I don’t want new crops for winter running I want more coverage so these should work fine paired with longer socks when the need arrises. My only negative is that the seaming in the back combined with the grey was not the most flattering. In black the seaming would have been just fine, but the combination of the attention grabbing seams and less forgiving color where a no go for me. Iconic Wrap Ok, I caved and got this in charcoal size 10. I don’t wear long sleeved shirts but I layer plenty of thin long sleeve cardigans in the fall, winter and spring…probably much more than I wear sweatshirts or sweaters. I liked this in a 10 but it would even work for me as I drop sizes as the more extra fabric you have the easier it is to put on and play around with it. The 8 looked good on too but was harder to play with and adjust. I’m not impressed by the price point on this. $88 is hefty and with the new HST it came out to $98!!! Oh well, at least there is a variety of ways to wear this, it’s multi season and the charcoal goes with everything. Dance Crops These are really cute on in the Static Charcoal and I love that the cuff is black. Maybe i’ll get them if there still around but only when I’m firmly a size 8 pant. Run: Swiflty (new and improved version): Size 10 & Size 8 Alarm. So there is a slight, very slight difference with the arms of this tank but the rest of the fit of the tank was exactly the same as my size 10 at home. Same low cut neck, still see plenty of Flow Y in the arms, same length and fit around the hips. I guess the difference is that you don’t see skin bellow your Flow Y in the arm holes but if you pull the tank down at all then you can still get it to that point fairly easily. I’m just not sure why this tank can’t be designed to be like the Cool Racerback Tank. *On a side note about the Run: Recharge Tank, it’s not actually all that scratchy as I’d mentioned before. I think because I tried a size too small it just felt less pleasant against my skin. I hate most knitted material against my skin because I have really sensitive skin so it felt scratchy to me but probably wont to most other people with regular skin. Push your Limits: Citron size 8. I loved this tank in Citron but it is way too supportive for me and would cause me a wicked case of plugged ducts in one wearing I’m sure. If I wasn’t nursing I would have snatched this one up because it’s a tank that would work well for running in as well as for wearing out. Particularly in the single colored citron. This top I would have gotten the size 10 as the light colored luxtreme shows everything. Commit Tank I tried on the size 8 Coal and was really impressed with how this tank looked on me. It’s long enough that it will stay down on me and it shapes nicely along the hips. This is not a loose around the middle fitting tank like the Light Up Tank is but it’s not super glued to you either. 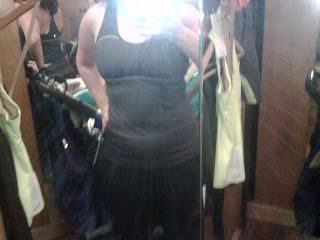 As far as level of support, I agree with the educator at Coquitlam Centre that this is not as supportive as the Push Your Limits Tank and is probably around the support of a Flow Y. Luckily you can easily wear your Flow Y under this and it doesn’t feel weird or look too bad through the mesh straps in the back. I think If I were to get this tank (down the road) I would try the size up just to see how much more room I get around the middle…but then again I’m in size transition so it would be best to stay away from any size 10 purchases that wouldn’t also look good as I size down. Here is a pretty bad picture taken in the fitting room so that you can sort of see the fit from the front and the back with a White Flow Y underneath. I couldn’t quickly manage to remove the flash so that’s part of the issue with this picture. I think I've talked myself into the iconic tank too….hopefully they will have some at the store when I get there later this week! I am 2 hours away from a store and don't get there often so I usually go in with a list of 20-30 things to try on! The girls there get quite a kick out of me! I can hardly wait to try on some of the things you have shown in your blog! Did you see the commit tank in the grey with stripes? I really like that one. I also want the fouette tank and the dance crops in static….I hope my credit card can handle it! bc residents have always paid 12% tax (5% gst and 7% pst prior to july 1) on adult clothing so nothing has changed unless you were claiming tax exempt as a purchase for a child 14 yrs and under.